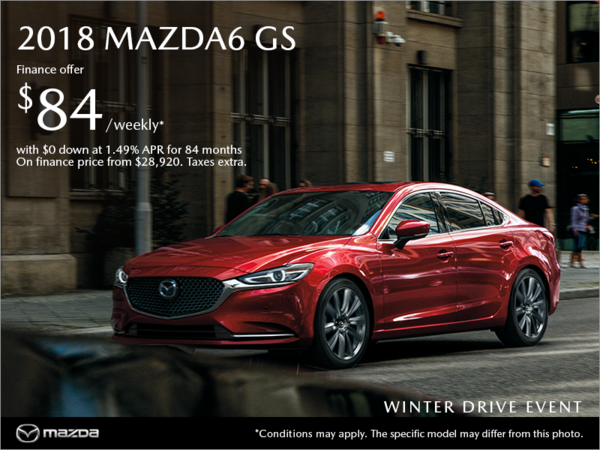 Finance the 2018 Mazda6 GS starting from only $84 per week for 84 months at 1.49% APR with $0 down. Some conditions apply. This offer ends on February 28th, 2019. 0% APR Purchase Financing is available on select new 2018 Mazda models. Excluded on 2018 MX-5/MX-5RF and all 2019 models. Terms vary by model. Based on a representative agreement using an offered pricing of $17,695 for the new 2018 Mazda3 GX (D4XK68AA00), with a financed amount of $18,000 the cost of borrowing for a 72-month term is $0, monthly payment is $250, total finance obligation is $18,000. Offer includes freight and P.D.E. of $1,695 and $100 air conditioning charge (where applicable). Offer excludes PST/GST/HST and specific duty on new tires. Winter Drive Credit offer (value up to $1,000) is available to qualifying retail customers who cash purchase/finance/lease a select new, in-stock 2018 and 2019 Mazda model from an authorized Mazda dealer in BC, AB, SK, MB between February 1-28, 2019. Amounts vary by model: $300 on all 2018 Mazda3/Mazda3 Sport, on all 2018 Mazda6, on all 2019 CX-3 and on all 2018 & 2019 CX-5 models. $475 on 2019 MX-5 ST GS models. $750 on all 2018 MX-5 ST/MX-5 RF, on 2019 MX-5 ST GS-P & GT, on all 2019 MX-5 RF models. Maximum $1,000 on all 2018 & 2019 CX-9 models. Winter Drive Credit applied before taxes. Some conditions apply. NOTE: Winter Drive Credit offer not available on 2019 Mazda3 models. See dealer for complete details. Based on a representative example using a finance price of $17,470/$21,470/$28,920 for the 2018 Mazda3 GX (D4XK68AA00)/2018 Mazda3 Sport GX (D5XK68AA00)/2018 Mazda6 GS (G4SN88AA00) at a rate of 1.49%/1.49%/1.49% APR, the cost of borrowing for an 84-month term is $938/$1,152/$1,552 weekly payment is $51/$62/$84, total finance obligation is $18,408/$22,622/$30,472. Taxes are extra and required at the time of purchase. Offer available on retail leases of new 2019 CX-3 GX (HVXK69AA00)/2019 CX-5 GX (NVXL89AA00)/2019 CX-9 GS (QVSM89AA00) with a lease APR of 2.49%/3.90%/1.95% and 130/130/130 bi-weekly payments of $130/$181/$219 for 60/60/60 months, the total lease obligation is $16,911/$23,495/$28,414, including down payment (or equivalent trade-in) of $0/$0/$0. First monthly payment is due at lease inception. 20,000 km per year mileage allowance applies; if exceeded, additional 8¢ per km applies (12¢ per km for CX-9 models). Offers excludes taxes. Offered leasing available to retail customers only. Cash purchase discount for all new 2018 MX-5/2018 MX-5 RF models is $4,000/$4,000 and cannot be combined with other offers, including lease and financing offers. As shown, price for 2018 Mazda3 GT (D4TL68AA00)/2018 Mazda3 Sport GT (D5TL68AA00)/2019 CX-3 GT (HXTK89AA00)/2018 CX-5 GT (NXTN88AA00)/2018 Mazda6 GT (G4TM88AA00)/2019 CX-9 GT (QXTM89AA00)/2018 MX-5 GT (L2TK68AAOO)/2018 MX-5 RF (L3TK68AA00) is $26,220/$27,220/$33,115/$37,570/$38,170/$50,970/$41,665/$44,665. All prices include $25 tire tax, $100 a/c tax where applicable, freight & PDI of $1,695/$1,795/$1,895 for Mazda3/Mazda6, MX-5/CX-3, CX-5, CX-9. Taxes extra. License, insurance, taxes and down payment (where applicable) are extra and may be required at the time of purchase. Dealer may sell/lease for less. Dealer order/trade may be necessary on certain vehicles. Unless otherwise stated herein, offers valid February 1-28, 2019, while supplies last. Lease and finance on approved credit for qualified customers only. Offers subject to change without notice. Visit mazda.ca or see your dealer for complete details." I wish to receive recalls, news and promotional emails from Destination Mazda Vancouver.